Emily Johnson shared this story during Sunday Worship on September 9, 2018. You can listen to it here. When Erica asked me to speak about today’s topic, risk, I found it slightly ironic, given that I take so few of them in my daily life. I consider myself of student of logic, a creature of habit, and frankly a bore. So it required some deep reflection to identify how risk had operated in my life, and specifically in my experience with the baking activity I lead at Pres House called Bake, Pray, Love. 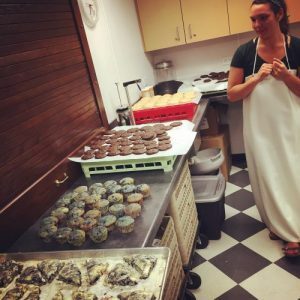 If you’re unfamiliar with this activity, Bake, Pray, Love is a form of service to our local community, in which bi-weekly baking nights are followed the next morning by baked good deliveries to homeless individuals on State Street. This concept was the offspring of one of my deepest passions and my long-honed hobby of baking. Bake, Pray, Love attests to one of the many beauties of Pres House, in which personal interests are mobilized as a form of service to the community and a tangible means of living out one’s faith. Members of the Pres House community welcome individual interests, no matter how seemingly unrelated to religion they may be, which is precisely what elevated my love for romping around in the kitchen to an organized form of service. All this has little to do, I initially thought, with the notion of risk. It wasn’t until I reflected on my first few weeks of leading Bake, Pray, Love nearly a year ago that I could clearly see the fingerprints of risk. There was the risk that few people would find the concept interesting, or that those who did wouldn’t have the time or flexibility in their schedule to take part. There was the risk that no one would be willing to trade an extra hour of sleep for a long morning trek down State Street. And the risk that I felt most acutely was that the people I was trying to serve—our often stigmatized neighbors taking up residence on the sidewalk—would be offended by or disinterested in what I had to offer. I distinctly remember the fear that my simple, well-intentioned offering would be perceived as a naïve gesture of pity baked into a cute little scone, glazed with ignorance and delivered with a misguided sense of self-importance. In truth, these fears and risks were not completely unfounded. There were nights when I was the only baking in our downstairs kitchen, staying well past 8 pm to bag hundreds of baked goods. There were also mornings when I was the sole volunteer schlepping around a tote of treats at 8 am, though Clare all too often accompanied me on the trudge to Capital Square. And my most unsettling fear, that my target community would reject my perhaps ignorant gesture, was also founded on several occasions. Many mornings left me with a knot of shame in my stomach because my cheery, high-pitched bid of “good morning” and offering of a homemade muffin was met with a gruff refusal or complete avoidance of eye contact. These instances proved to me that the risks associated with this activity were real, but more importantly, that they were survivable. Sure, it may have felt like a fluffy form of solitary confinement scrubbing tables and washing dishes for hours on a week night, and I may have felt some self-pity walking down State Street with a numb nose in early December with no one at my side. But these moments were largely due to my own aversion to asking for help and my feeble attempts at recruiting volunteers. Lastly, the sting of rejection felt when someone didn’t swoon over my homemade granola bars was numbed to oblivion by the occasional tearful handshake from a neighbor with no prior prospect of food. With every risk I faced throughout my experience with Bake, Pray, Love, instances of fears coming true were no contest for the expressions of gratitude and sense of fulfillment I received along the way. The risks that I faced with this activity taught me many things, including a stark lesson in humility. I was reminded that success is not measured by the number of volunteers you can attract or the number of cinnamon rolls you can dispense in an hour. I also learned the deceptively obvious lesson that service is not meant to be self-serving. When I embraced these truths, I realized that my small-scale form of service really ran no risks at all. When I accepted that I wasn’t in line to solve a pervasive socioeconomic problem or amass an apron-clad army of volunteers, I could see that really the only risk in this situation was assumed by the unsuspecting people on State Street who accepted unlabeled baked goods from an overzealous girl with an unnaturally fixed smile. Risk, I learned, is often overestimated and can be easily overcome by asking for help and walking humbly in faith. Often the biggest risk we run is letting our God-given gifts languish without sharing them with others. So if you have a passion you’re willing to pursue, you’ll realize that risk is only a fear-inspiring word that can be quickly conquered by personal humility and a strong sense of faith.